Everyone could save a little during the holidays. I ordered each of them, and now I’m sharing both what I got and what I thought. Here’s a full report on what’s actually FREE, what’s pretending to be “FREE” and which ones are worth the hassle. Sign up online to create a registry at Babies”R”Us and you’ll get over $50 worth of free baby samples like a MAM bottle and pacifier, along with coupons and samples. To receive your bag of goodies, head to Babies”R”Us with your confirmation email and they’ll hook you up. I signed up online for a free program called Enfamil Family Beginnings and received over $50 in free products and coupons shipped to my house for free! See exactly what I got in my Enfamil Family Beginnings kit. I signed up for two free trials from The Honest Co to maximize the $5.95 flat-rate cost of shipping. I got the diapers and wipes bundle (7 diapers+10 wipes) and the essentials bundle (soap, shampoo, lotion, household cleaner). This exact set sells at Target for $13.95. I saved 60%. The most important thing to note when ordering this bundle is that you have 7 days following your order to cancel your ‘membership’ by calling 1.888.862.8818. If you do not cancel, you’ll be charged for a monthly subscription. I called Gerber [1-800-408-7277] to ask a question about the free Gerber Baby Nutrition Kit, available from your pediatrician or hospital. But, when the Gerber rep picked up my call, I was immediately asked if I’d like samples in the mail. I said yes, and a week later I had a can of formula, a 3-6 month onesie, a $2 coupon, and a handwritten note from Gerber. Get your first book free from World Book New Explorers. I just paid $1 to ship! And, I was surprised with a second hardcover book for free! I’m not sure if it was an error or a bonus! Make this freebie even better when you add a two more free books from World Book Junior Explorers and World Book Expert Explorers, perfect for older siblings. Once you receive your books, you have three weeks to cancel your monthly subscription by calling 1-888-215-4327. I created a free Target baby registry online and scored a bag of freebies valued at $70 (including a coupon for free Starbucks coffee)! I just set up a quick online registry using an email address and baby’s due date. Then, on my next trip to Target, I went to customer service and said I’d created a registry, and they handed me the bag of freebies. Please note, you may need to show your registry confirmation at the customer service desk. See everything I received in my Target Baby Registry gift bag. This is another baby registry incentive, like Target above. All I had to do was create an online Amazon Baby Registry, then spend at least $10 on any one item from my registry. So, while it’s probably best to spend the $10 on diapers or bubble bath, in theory you could spend it on a jump rope or peanut butter-flavored dog toothpaste. Once your $10+ item ships, log back in to your Amazon Baby Registry and select your free welcome box. It ships to you for free. You’ll also receive a coupon worth 15% off any one order of items from your registry. View step-by-step instructions on how to get your box of freebies. If you live in a participating community, your child can sign up to receive one free book per month from birth to age five. That’s 60 books total! This program isn’t need based; it’s available to every child. Your eligibility is strictly dependent on whether someone has volunteered to bring the program to your city. (Maybe that person could be you?) Unfortunately, when I tested about ten different city/zip combinations, I only found Dolly’s Imagination Library in 2 of them. Some communities have adopted the program, and others haven’t. It’s not a ‘by state’ or a region thing. For example, one city in California will have it while another won’t. The state of Tennessee is the only state that appears to have adopted this program statewide. See if your city participates, and register your child now! I joined a free program called Similac StrongMoms and received the Similac Neosure Ready-to-Feed formula ($10.99 value) and a $2 off coupon. Please note, this welcome gift seems to vary greatly. Three of the ladies at the office joined, and we all got something a little different. One of us got $10 in Similac checks instead of samples. These free Baby Einstein books are the first of three book bundles I got for “free” from a company called Early Moments. (See my Dr Seuss and Sesame Street books.) For just the $5.95 cost of shipping, I received three board books, one soft book, and one ring of flashcards. That’s just $1.19 per item, which is amazing considering the starting price at Amazon is around $3.99 per book. Early Moments is a monthly book club. To avoid additional book charges, simply cancel your account after your “free” books ship by calling 1-800-353-3140. See full details and read my full review of this Baby Einstein book set. I used coupon code “FREECANOPY1” at CarseatCanopy.com and got a $49.95 carseat cover for $0.00, plus $14.99 shipping. Obviously, the shipping is high, no doubt to make up for the “free” product. But, in the end, $14.99 is cheaper than any other carseat cover I’ve seen, and the quality of this cover is excellent. This was the second book bundle I purchased through parent company, Early Moments. While the Baby Einstein set is more infant appropriate, this set is my overall favorite. By joining the Dr. Seuss Book Club, I got five hardcover Seuss books, plus a sticker sheet and workbook for just $5.95 shipping. That’s just $1.19 per book! This is a subscription service. Members can cancel their membership upon receiving the first shipment confirmation by calling the Early Moments Consultants at 1-800-353-3140. I got this free baby journal From Pea to Pumpkin, (an $11.54 value). Residents of CA or WA can get it for free from a program called ScholarShare. Expect to receive some ScholarShare promotional materials with the journal, but don’t worry about continued SPAM. I received none. 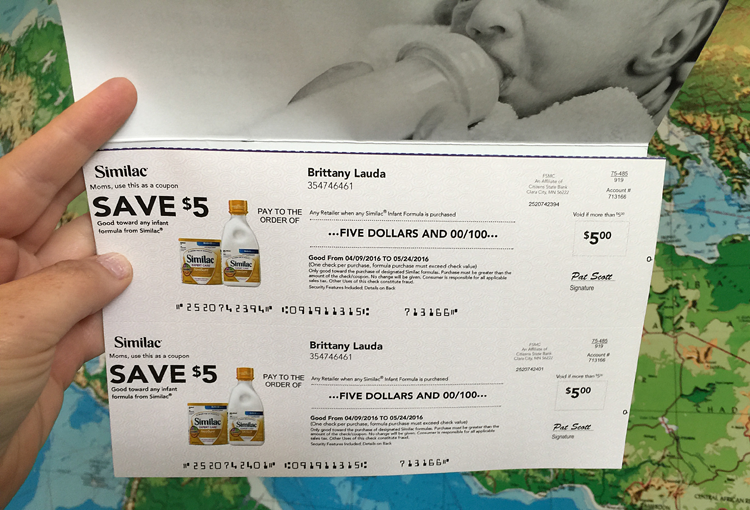 I printed a coupon worth $5 off my store brand formula! To get yours, head over to StoreBrandFormula.com; enter your name, location, desired formula brand, baby’s birth date, and click “Get My Coupon.” Then, print the coupon immediately. Don’t forget to use the back browser to print the coupon a second time! I’ve long been a member of both Amazon Prime and Amazon Family. Join Amazon Familyand get a free month of Prime 2-day shipping and 20% off diaper subscriptions. And don’t forget that you can use Amazon coupons on top of discounts. I got a free 15 oz sample of Nutiva Coconut Oil from Thrive Market just by paying $1.95 in shipping! I also received 15% off my next order. ThriveMarket is a members-only site. The free coconut oil offer automatically enrolls you in a 30-day trial membership. You’ll receive an email when your free trial is about to expire. Cancel anytime within the first month ,and your credit card will not be charged. I signed up for Seventh Generation Baby and received a pack of size 3 Free & Clear diapers ($9.99 value), wipes ($2.99 value), and Grove Collaborative Lip Balm ($3.95 value) for just the cost of shipping, $5.95. I ordered five board books from BabsyBooks.com and used promo code GET5FREEBOOKSto drop the price from $40 to $0. I just paid the shipping cost of $13.99. Babsy Books is owned by the same parent company as CarseatCanopy, so it’s the same shtick. The products are promoted as free, but shipping is exorbitant. In the end, five books for $13.99 is $2.79 per book, a great deal. See my full Babsy order rundown. I ordered a baby sling from SevenSlings.com and used code FREESLING4ME to get the $39.95 baby sling for free. I just covered the shipping cost of $12.99. The sling is simple but well made. It’s 97% cotton, 3% Lycra and fits infants and toddlers up to 35lbs. SevenSlings shares parent company with BabsyBooks and CarseatCanopy. I signed up for Elmo’s Learning Adventure and got three learning kits for “free” plus $5.95 shipping. The package I received contained 14 books and a giant stack of flash cards. The binding on the hardcover books is on the cheap side (makes crackly noise when you open the books wide). Still, this is easily a value closer to $50, and I feel great about getting it for under $5. This is a monthly book club. I decided to cancel once I received my first order. I did so by calling 1-800-353-3140, and I was not charged again. See details and read my full review of this Elmo Learning Adventure set. I bookmarked the landing page for free Kindle edition children’s books from Amazon. I’ve downloaded dozens of books, many of which are appropriate read-aloud books for toddlers. Shop best-selling kids eBooks and sort by categories like Animals, History, Sports & Outdoors, Early Learning, Action & Adventure. I bought a 100% cotton nursing cover from UdderCover.com. Retail price is $34.95, but I used coupon code FREEUCOVER1 to drop the price to $0.00! I just covered the $14.99 shipping cost! Each cover features a rigid neckline bow that allows direct eye contact with your baby while providing maximum coverage. Did you know that Gymboree offers classes? I printed a free class coupon and received a voucher for 20% off my next purchase at Gymboree, Janie & Jack, or Crazy 8. I signed up for the Walmart Baby Box, which is a 4x per year subscription box that costs just $5 per box in shipping charges. If you do not wish to continue this service, simply submit a cancellation request through your subscription account on the site. 25. Free toys from Pampers Rewards⭐⭐⭐I’ve long been a member of Pampers Rewards. I undutifully enter my diaper codes every few months. I actually take a pic of the code on each package before tossing it in the recycle bin. Then, every few months, I scroll through my photo stream and upload my codes. I’ve redeemed my points for Melissa & Doug toys on a couple occasions. Takes me about a year to have enough points for a decent prize. Follow my journey: How I’m Getting Free Toys by Purchasing Pampers. I ordered 50 4×6 prints from Shutterfly (a $7.50 value). I used code YUR49S at checkout, and the price dropped to $0.00. All I paid was the $3.99 shipping cost. This promo is one-time use. I got the Nature’s One free 12 oz sample of Baby’s Only Organic Formula, PediaSmart, or Pediavance. I just covered the $5.95 shipping cost. Even with the shipping cost, I still saved 58% (Baby’s Only sells for $12.36 on Amazon, and PediaSmart sells for $14.33 on Amazon). I got a free 1 year subscription to Parents magazine with no strings or autorenew attached. Another free subscription you can pick up is American Baby magazine. I got 20 free reusable cotton breast pads from BreastPads.com. After adding five sets (4 each) to my cart, I used code 10FORFREE to drop the price to $0.00. But, like with all these other offers, I had to pay a whopping $14.99 shipping. Even with the shipping cost, you’re scoring 20 pads for just $0.75 each. Quality was fine, but price didn’t feel like a red hot deal. I signed up for a free Zulily membership, and I’ve since saved on an Ergobaby carrier and Petunia Picklebotton diaper bag. Zulily sales prices even beat Amazon! I signed up for a Kindermusik class for free. Kindermusik is an early childhood education music program for newborn to 7 years old. Once I signed up, a local Kindermusik rep contacted me to set up my class. She did try to up-sell me, but when I told her I was only interested in the free class, I didn’t get any pushback. I got five sets of BabyLeggings for free plus $14.99 shipping. I used code GIVEME5FREE at checkout to drop the $50 price to zero. That’s like paying $2.99 per pair, which feels like an okay price, but not a screaming deal. I submitted a request for “samples/coupons” to Babyganics months ago. I’ve followed up on my request twice, and I’ve been told the samples are on their way. It took THREE MONTHS, but I finally received my samples!! I received three tiny samples and four coupons (three $1.00 off and one $5.00 off. I’m still giving Babyganics a rating of 1 because the samples are tiny and it took tons of effort and followup to get my freebies. I ordered a free nursing pillow with the code GIVEME1FREE at NursingPillow.com. This pillow is valued at $39.95. I just paid the $14.99 shipping fee. The verdict: I did not care for this pillow. It is far too soft to give the right support for a nursing baby. I don’t think it’s worth the $14.99 shipping price. Just like I did with The Honest Company, I signed up for two free trials from EveryDay Happy (diapers, wipes and trial sizes of shampoo, hand soap, etc). All I paid was the $5.95 shipping cost. I was very dissatisfied with the diapers. While they may be non-toxic, they are not leak-proof. The fragrance-free soaps and detergents weren’t bad. But, they weren’t something I’d rush to rebuy. This is one of the only baby freebies I would not order again.